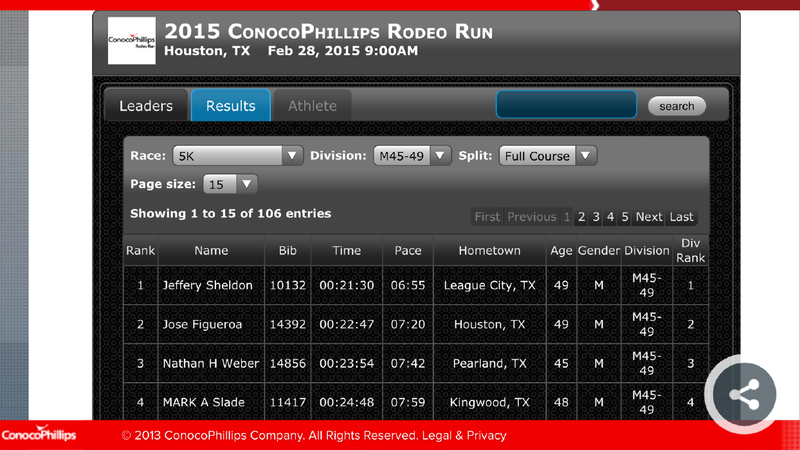 Are you running in the ConocoPhillips Rodeo Run on Saturday, February 28th, 2015? UPDATE!!! Great job by Officer Slade in the 5K! 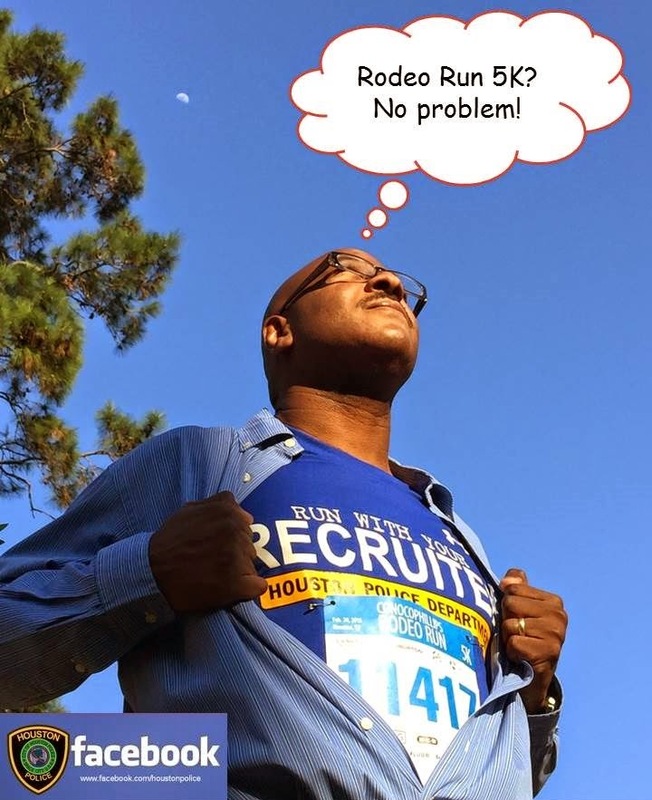 Officer Mark Slade of the Recruiting Division will be running the ConocoPhillips Rodeo Run 5K tomorrow. Both the 5K and the 10K go by HPD Headquarters at 1200 Travis. If you are running tomorrow, look for Officer Slade and say "Hi!" 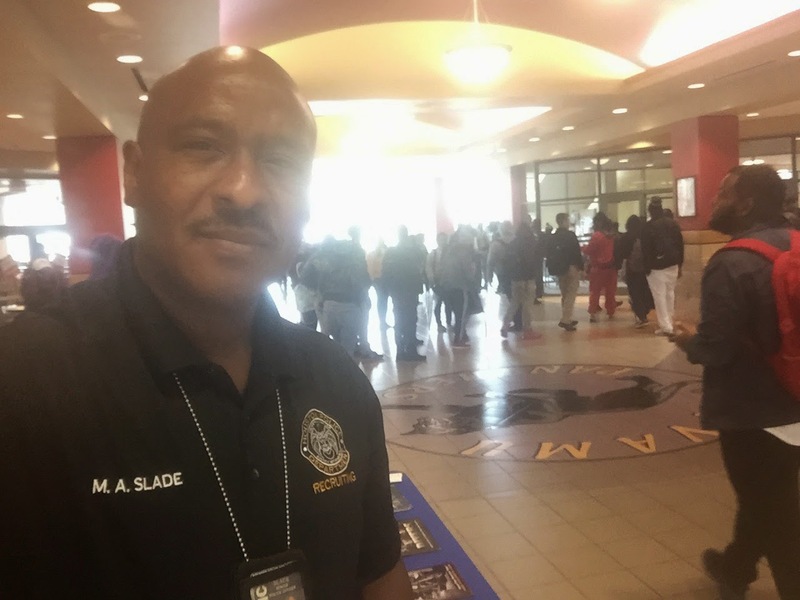 Officer Jones of the Recruiting Division was at the University of Houston - Downtown meeting with students today and talking about how to start a career with HPD. 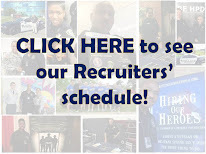 If you want to know how, go to www.hpdcareer.com or call the Recruiting Division at 713-308-1300 or (800) 252-0473. 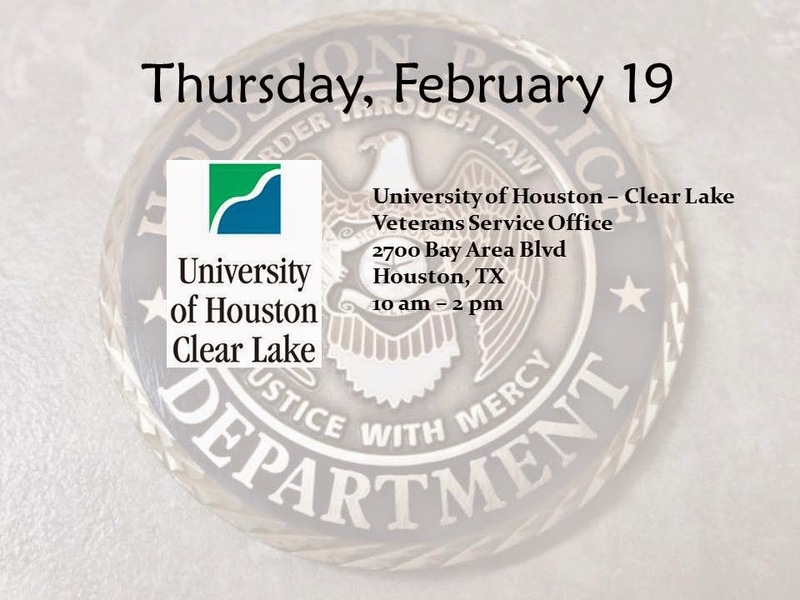 Officer Gilmore is out at UHCL NOW until 2pm waiting to talk to you about starting your career with HPD. If you can't stop by, call the Recruiting Division at 713-308-1300 or (800) 252-0473. Recently, Officer M. Vollert and Officer B. Ng, both assigned to the South Central Patrol Division, were dispatched to a family disturbance call at 1500 Munger Street. A citizen stated that she had had issues in the past with the suspect, her son, and that he had assaulted his ex-girlfriend and damaged her phone. She further stated that she was concerned for their safety. Officer Vollert was able to talk to the agitated suspect, who had locked himself inside the house, and tried to calm him down using a professional and respectful tone. Officers S. Duron and A. Ripley arrived to assist with the call since Officer Duron was familiar with the location from prior calls to that address. 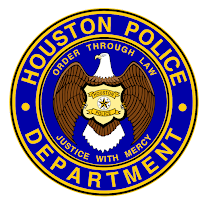 Officer Vollert called a Harris County assistant district attorney who, based on the facts of the incident, accepted felony family violence charges against the suspect. Officer Vollert also discovered that the suspect had a theft warrant out of Harris County. 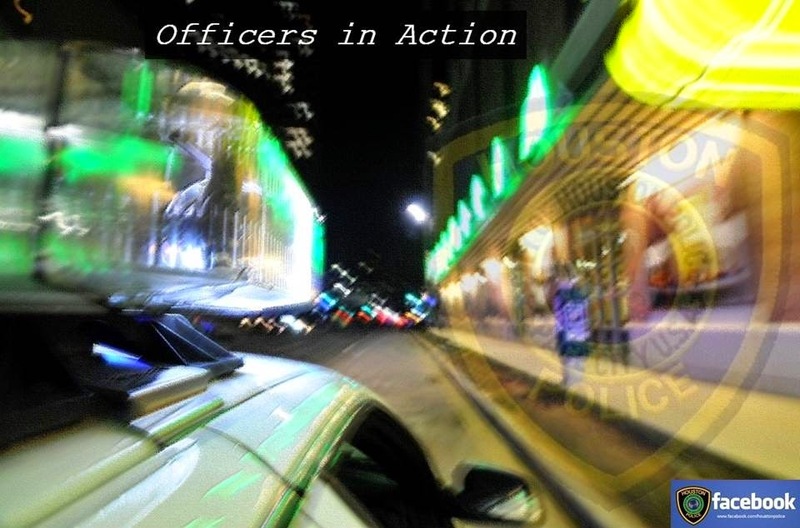 Now the officers had to develop a plan of action for placing the suspect into custody. All doors and windows to the residence were locked from the inside. Officer Vollert continued to develop a positive rapport with the suspect and was able to convince him to open the door for officers. The suspect was placed into custody without incident. After making sure the suspect understood the charges, officers explained the procedures for family violence arrests to the victims and faxed a Magistrate’s Order of Emergency Protection to the Harris County District Attorney’s office. Officer Vollert is to be commended for his outstanding dedication to duty and exemplary police work due to the face that he was able to verbally communicate and deescalate a very volatile situation. Due to the professionalism and diligence exhibited by all officers on the scene, a family violence felony suspect was arrested without incident and taken to jail. 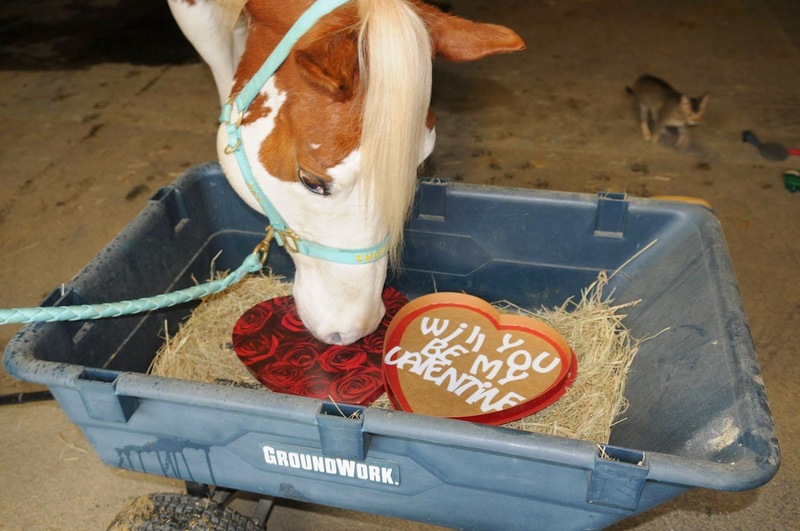 Happy Valentine's Day from HPD! REMINDER: This Saturday, February 7th from 10 am – noon is the City Wide Town Hall Meeting. 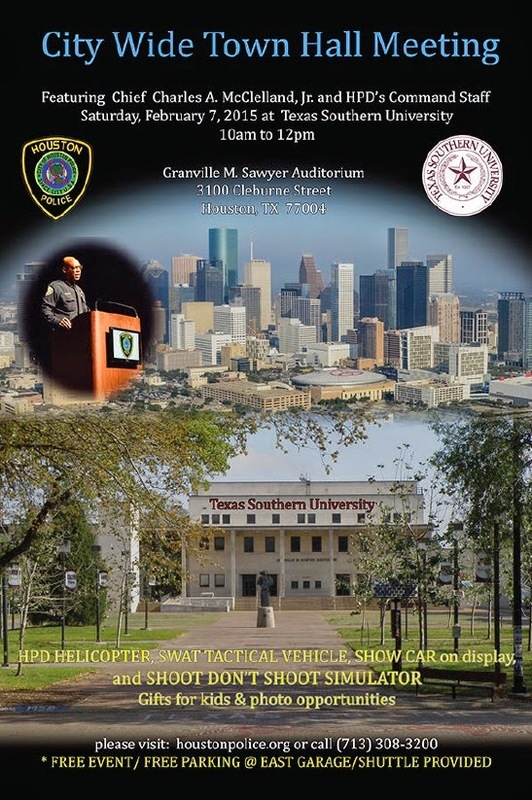 It will be at Texas Southern University, Granville M. Sawyer Auditorium, 3100 Cleburne Street. Chief McClelland and his commanders will take questions and find out what issues are of most importance to the public. Members of the public are encouraged to attend and to voice concerns and ask questions. 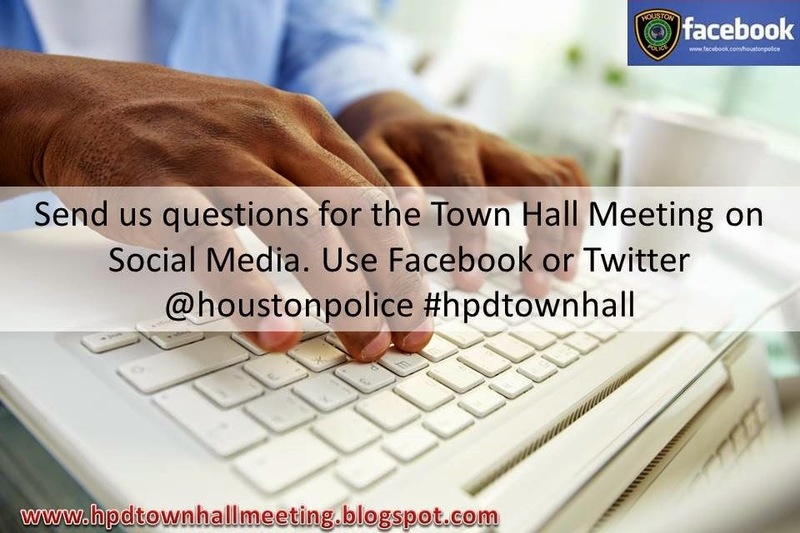 This is the third city wide town hall meeting and is a chance to continue meaningful dialogue between HPD and citizens. Houston Police Chief Charles A. McClelland, Jr. welcomed dozens of police recruits this morning to their first day of training in the department's 222nd Police Academy Cadet Class. shared with the new cadets.